With his future at Fox News looking more precarious than ever, Bill O'Reilly is fighting back. On Tuesday night, after weeks of near-total silence, a lawyer for the embattled host declared that O'Reilly had been "subjected to a brutal campaign of character assassination that is unprecedented in post-McCarthyist America." The statement came more than two weeks after the New York Times first reported that O'Reilly, Fox and parent company 21st Century Fox had paid $13 million in settlements over more than a decade to five women who had accused him of sexual harassment or verbal abuse. Marc E. Kasowitz, the lead attorney for O'Reilly, said his law firm had "uncovered evidence that the smear campaign is being orchestated by far-left organizations bent on destroying O'Reilly for political and financial reasons." He promised to release "irrefutable evidence" to bolster that claim. 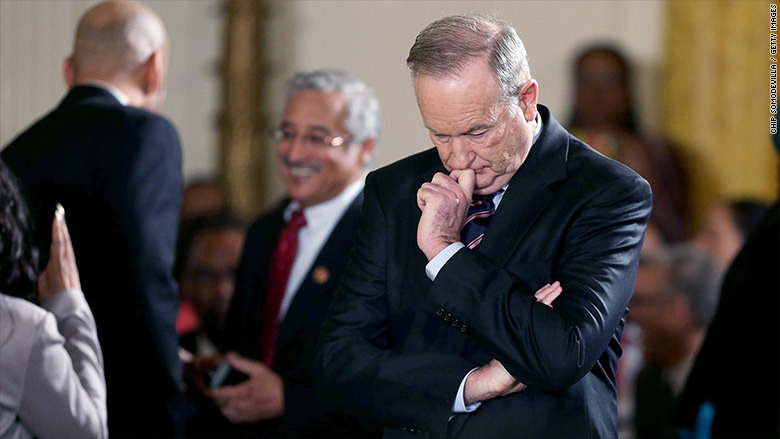 Meanwhile, a well-placed source told CNNMoney Tuesday afternoon that Fox and O'Reilly have begun talking about an exit, though that was denied by the O'Reilly camp. O'Reilly is currently on vacation and scheduled to return to "The O'Reilly Factor" on April 24, though Fox News is no longer responding to questions about whether that will still happen. Since April 1, when the Times published its report, accusations against O'Reilly have dogged him and the network. Lisa Bloom, a civil rights attorney and television personality who represents two of O'Reilly's accusers, has called for the host's termination from Fox. At least 60 advertisers have pulled their advertising from O'Reilly's program, though almost all placed it elsewhere on Fox's programming. Throughout this process, O'Reilly stayed silent. He issued one statement on the day the Times report was released, in which he said the accusations were without merit, then did not address the controversy again. That changed Tuesday. Earlier in the day, Kasowitz released a separate statement disputing new accusations from one of the women represented by Bloom, an African-American former clerical worker at Fox News who, Bloom said, called a Fox News HR hotline to make an anonymous report accusing O'Reilly of sexual and racial harassment . "It is outrageous that an allegation from an anonymous person about something that purportedly happened almost a decade ago is being treated as fact, especially where there is obviously an orchestated campaign by activists and lawyers to destroy Mr. O'Reilly and enrich themselves through publicity driven donations," Kasowitz said. O'Reilly's pushback campaign may have started on Monday evening, when the Washington Post laid out the case being put forth by Team O'Reilly against his most visible accuser, Wendy Walsh. Walsh has claimed that the host dropped her from the program and revoked a promise to make her a paid contributor on Fox News when she declined an invitation to his hotel suite. In that article, O'Reilly's allies said there was no such job offer, pointing out that he helped promote Walsh's book and that she appeared on his show 13 times after the alleged incident. Bonny Forrest, a psychologist who appeared on "The O'Reilly Factor" with Walsh, also raised doubts about the allegations. Walsh has not filed a lawsuit against O'Reilly, nor has she sought compensation. Bloom, who represents Walsh, told the Post that Walsh continued to appear on the program after the alleged incident in order to become a paid contributor. Fox News parent company 21st Century Fox will hold a board meeting on Thursday, a spokeswoman told CNNMoney. A source said O'Reilly is likely to be a primary topic at the meeting.